Danish director Lars von Trier is anything but conventional. He was instrumental in the creation of the Dogme manifesto and its back-to-basics, stripped down movies. This basically put his little corner of the world on the map in terms of moviemaking. He was the person behind the television miniseries The Kingdom, which formed the basis for Stephen King's Kingdom Hospital, and wrote and directed Bjork in Dancer in the Dark. 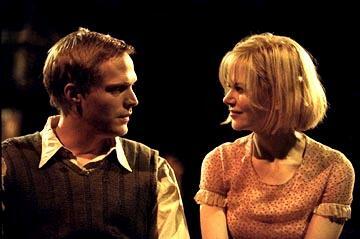 Dogville is a step in another direction completely, stripped down this time in term of sets. It was an audacious thing for von Trier to do, and, like some of the intents of the Dogme movement, forces viewers to pay attention strictly to the actors and their performances. It is essentially one big experiment in cinema, and it doesn't quite work. It sometimes smacks of pretentiousness, but mostly feels like a bare bones stage production. Dogville's profile was raised even more at the 2003 Cannes Film Festival, where it was in competition for the Golden Palm Award (it lost to Elephant) because of its perceived anti-American feelings. Is it anti-American? Not really. The brunt of the story is how a small town that looks inviting quickly turns on a young woman. Some people thought that this small Colorado town represented the Bush administration, in particular its more recent actions that stem from the War in Iraq, but this is probably a stretch. The most interesting aspects of Dogville is how von Trier (The Idiots) chose to film it. All of the action takes place on a big set that simulate the town. There are now buildings, only outlines in chalk on the floor of rooms. The actors knock on and open fake doors, with foley taking care of the sound effects. There are some props like the random bed, chair, or cabinet, but most everything else is written in chalk on the ground. All of the actors go about their roles as if everything is there, so one can see what everybody is doing inside their houses because there are no walls. Then, one of the most uninteresting aspects of Dogville is that it clocks in at nearly three hours. Von Trier spends too much time on extraneous things and sets the mood for far too long, with a minimal amount of payoff. It would have been just as powerful a movie if it were half as long. Instead, Von Trier splits the film into a prologue and nine chapters, separated by title cards, with constant narration by John Hurt (Owning Mahowny, Harry Potter and the Sorcerer's Stone). This is the first film in a proposed trilogy by von Trier, and unfortunately because of scheduling conflicts, Nicole Kidman (Cold Mountain, The Human Stain), will not be able to reprise her role as Grace, the stranger who stumbles into Dogville. She is running away from gangsters at the beginning of the film, and catches the eye of Tom Edison (Paul Bettany, The Reckoning, Master and Commander). After some trepidation, the small town decides to allow her to stay, knowing full well that some unscrupulous people are after her. Everything starts innocently enough. Grace helps out the various families, doing chores, tending to the elderly and small children, and slowly winning their trust. Unfortunately, the town knows a good thing when it sees one, and everybody slowly begins to take advantage of Grace. Since her position is very tenuous, she is afraid to speak out in protest, confiding only in Tom. There are some great actors in the film, including Lauren Bacall (Presence of Mind, Diamonds), Patricia Clarkson (Miracle, The Station Agent), Stellan Skarsgard (Taking Sides, The Glass House), and Chloe Sevigny (Shattered Glass, Party Monster), but the overriding problem is that nobody has much to do. Kidman is a phenomenal actress and she and von Trier put Grace through some horrendous experiences, but unlike some of her other roles, the pain her character feels fails to translate to the viewer. However, the viewer is left in disgust by the residents of Dogville, and how quickly they turn on their guest is shocking. 2 hours, 57 minutes, Rated R for violence and sexual content.